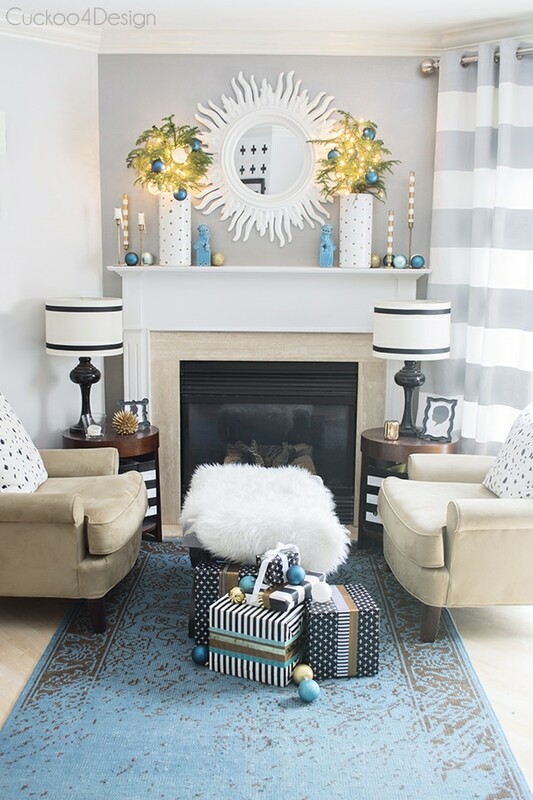 It’s time for Lindsay’s (The White Buffalo Styling Company) Blogger Stylin’ Christmas Home Tour 2014 and I’m so thankful to be able to participate again this year. I’m welcoming all the new visitors from Julie Blanner and hope you like what you see and stay a while. This Christmas blog hop is my absolute favorite and I hope you will be able to tell in my photos. I had so much fun decorating again this year and I went with pink, teal and green Christmas decor. I so wish I could show you what our house looks like at night because that’s when it becomes truly special to me. I made all the gold stars and some of the painted Christmas balls. I prefer to not overload our real Christmas tree since I love the natural beauty of it. That’s why I usually keep it on the simpler side. And if you can’t tell by now, I have an obsession with stars. Monkey loves to snuggle on her favorite spot. It’s unbelievable that she was a homeless cat last year freezing around this time of the year on our front porch in her igloo, isn’t it? She even goes as far as to snuggle in bed with the other three cats which melts my heart. I’m so glad they somewhat get along. She is able to still come and go as she pleases thanks to her amazing electronic cat door and leaves me the occasional disgusting present, yuck! I changed it up a bit this year by not using a garland and placing Norfolk pines in vases instead. Last year I added all kinds of different Christmas balls to the chandelier (click HERE to see) and to change it up a little this year, I only used clear ornaments and added some garland to the top of the chandelier. I really love the festive look. The new curtains I painted are the perfect elegant backdrop to all the natural greens this year. It’s a completely different feel to the rest of the house which I really like. I used the Rosenthal plates we received for our wedding and added my great-grandmother’s antique flatware to the table. Ornaments are hanging in the window again with my new painted curtains (Click HERE to read about them). 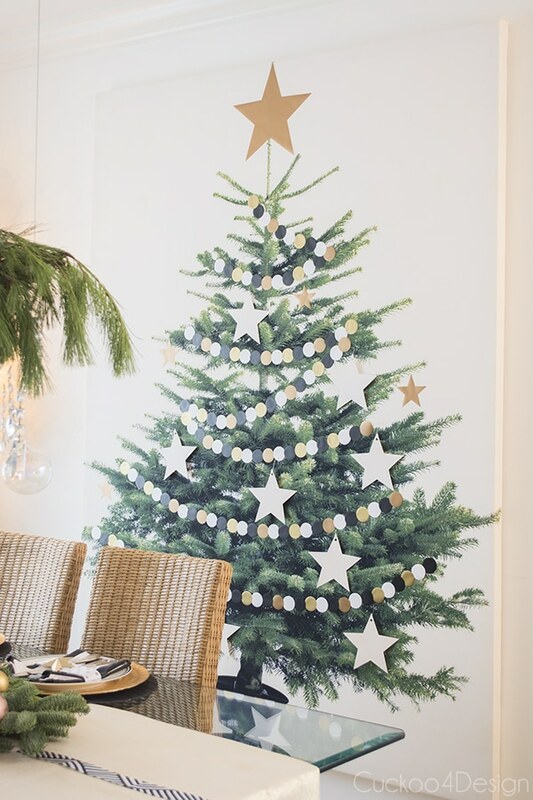 The Ikea Christmas tree canvas is making it’s third appearance in our dining room because I love it so much but this year I added my vinyl stickers and the stars that were on our real tree last year. 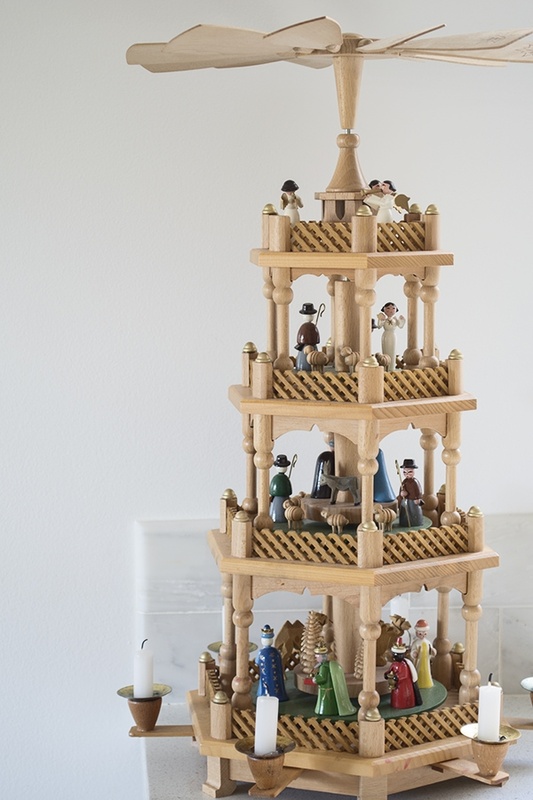 You can buy an almost identical German Christmas pyramid HERE. I will be posting a couple tutorials about the DIY’s that I made for this tour, so make sure to come back for a visit. 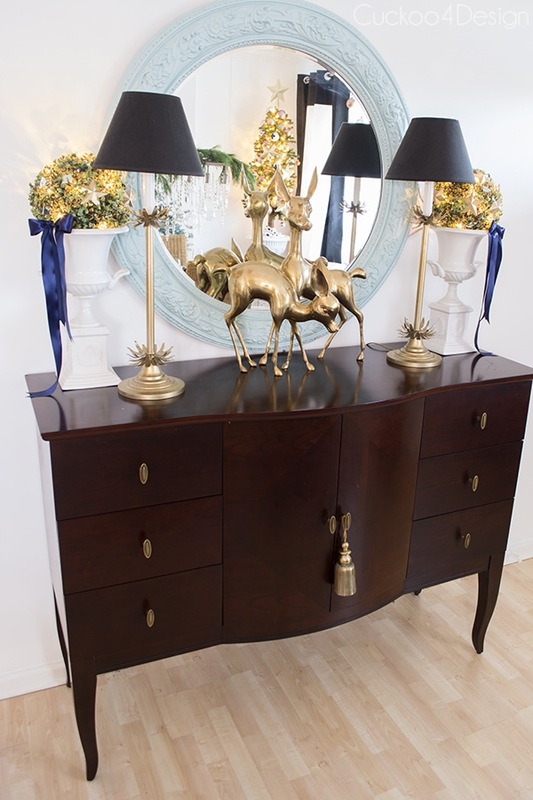 I hope you enjoyed my tour this year and that you go and hop on over to the next blog in line which is Kelly’s amazing Christmas tour at Eclectically Vintage. I just adore her and her style. I’m wishing all of you a ver Merry Christmas and a beautiful holiday season. Thanks Summer, it’s totally my favorite week of the year. Looking forward to each and every post. I love how colorful your home is, even in the Christmas time. I really like the color palette you have picked and all the details from pillows on the sofa to the area by the fire place. What a great way to welcome Christmas time. Thank you for sharing! Julia, your house is simply magical. Your chandelier is absolutely stunning, I think it’s my favorite thing I’ve seen this entire holiday blog tour season!!! BEAUTIFUL!!! 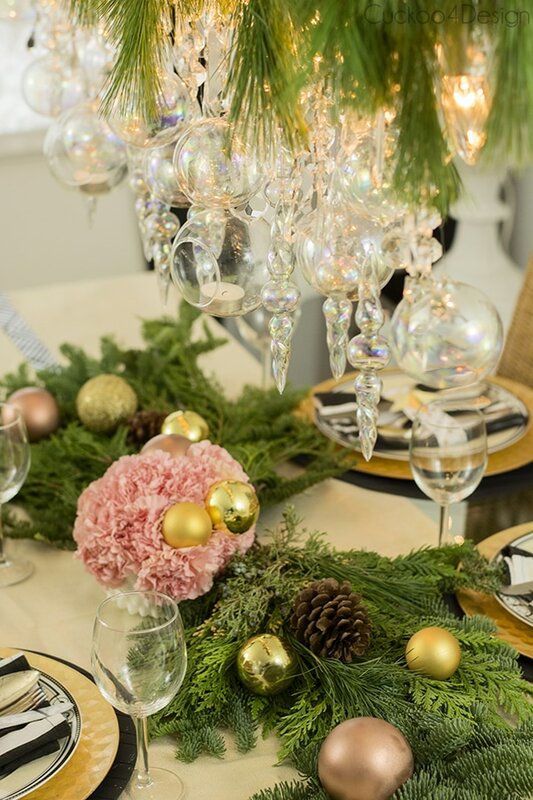 I love that idea of the clear ornaments and think I will use your idea to add a little sparkle to my dining room too. Thank you for sharing your home and your creative and lovely ideas. Wishing you and your family the happiest of Christmas seasons! I also wish you family a happy Holiday Season and thank you so much for all your visits and sweet comments. Thank you so so much Lisa! Your home looks absolutely stunning Julia! Love all of the beautiful colors and sparkle – especially your DR chandelier – amazing!! Thank you so much Kris! 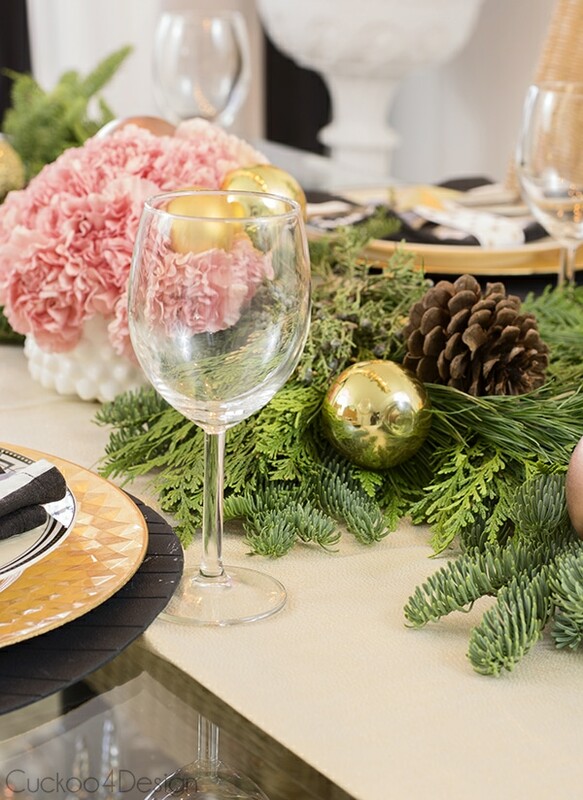 I love your fresh take on holiday decorating – the colors are just yummy. Everything looks so festive and inviting. I used to have a smaller version of the German pyramid you have. Ed had it when he was a child, but over the years it began to fall apart. I still have some of the pieces and hope to use them to make something with someday. Seeing yours made me smile. Thanks so so much Diane. Mine actually keeps falling apart in some spots too, but I keep glueing it along the way. It was a wedding present when we got married in Germany and it is very special to us. So pretty Julia!! 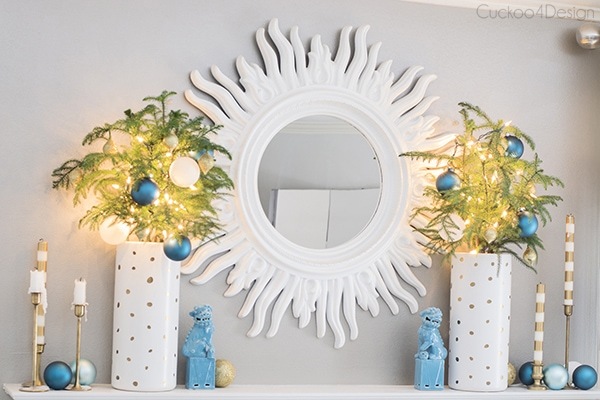 I love your house and your holiday decorating fits perfectly with your fun style! WOW! it is insanely beautiful julia!!!!!! your dining room!!!!!!! OH MY LORD i love it! so glamorous and feminine and beautiful! and of course i love all the turquoise accents!!!!!! Thanks my friend. Lilly thinks it’s a princess chandelier or Ice Queen chandelier and she loves eating fancy. Your tour is stunning! I love all the stars too! It’s a total obsession of mine. Thanks so much Sarah! Julia, I LOVE all of your color-infused holiday decor. It is so beautiful! 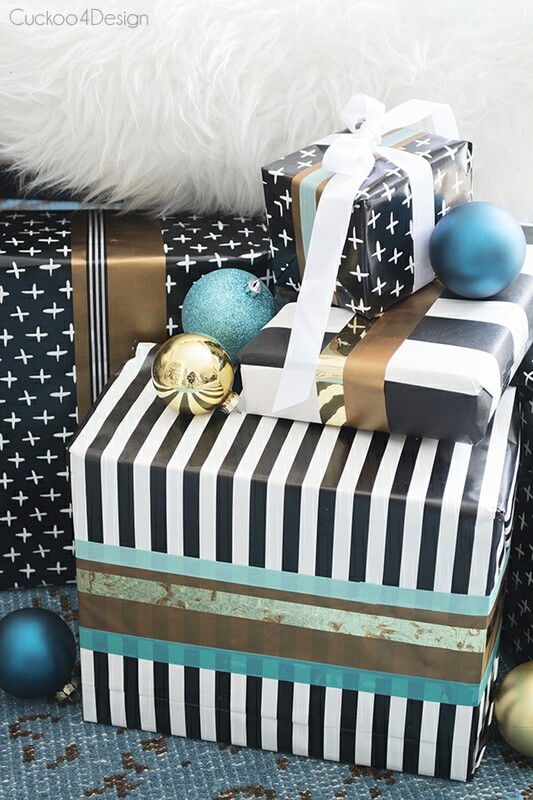 And that cross wrapping paper is awesome and makes such a statement. Beautiful job, friend! Julia, just when I think your home cannot become more beautiful…you prove me wrong! I love the greek key style pillows from Lowes, I have rotated them in and out of the rooms in my home for a couple years-they seem to be perfect anywhere! Your posts always inspire me, thank you. Warm regards from upstate NY, and many blessings to you and your precious family. Yes I agree those pillows are so versatile and I rotate them too. I got such a good deal on them when I actually bought them for $2 each. And thank you so so much. WOW Julia. You really out-did yourself. I love everything. My eye immediately went to those four pictures with paint stripes. So pretty! 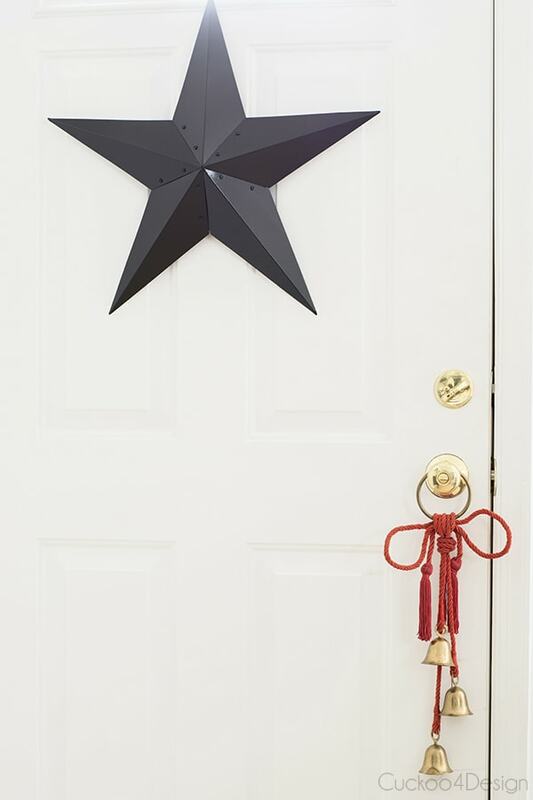 I also really really love your door hanger with tassels. And the garland over the dining lamp. Swoon!! Everything is just so beautiful!! Thanks so much my friend, you always leave the sweetest comments and they make me smile. Everything is so beautiful. I am totally in awe of your dining chandy. So beautiful with all the ornaments. Your entire home is stunningly done. Thank you so so much Marty. Oh my, Julia!! It couldn’t be more beautiful and I echo everyone, can we all just come hang out and ooh and aah over that dining room?!! So gorgeous!! Enjoy it all with your family! Thanks so much, I’d love for everyone to come over and hang out, that would be a fun time for sure. It was worth the wait! Your chandelier is stunning! I love the gold striped candles and the entire mantel for that matter. All of your little trees ore gorgeous. It is all gorgeous and totally you! Where did you get the striped gold candles? Thanks so much Robin, the striped gold candles were from HomeGoods. I LOVE those swiss cross ornaments. I love how Christmas in your home is so bright and happy and colorful. You did great my friend! I mostly do bright, colorful and happy for the kids. My daughter adores it! Thank you so much. Love! You are a gal after my own heart. I wanted to do a “colorful” theme this year and it just fell by the wayside. But if I did one I would have wanted it to look like yours. I love what you did. Looks so modern but still festive! 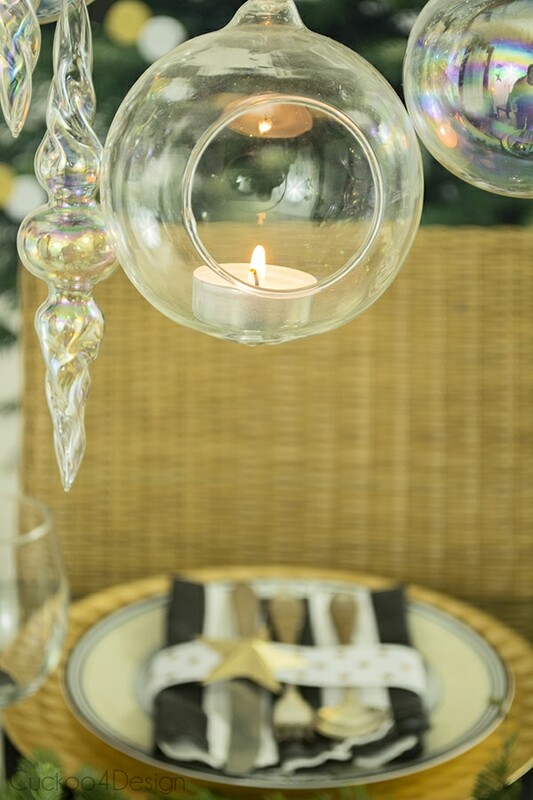 The hanging glass ornaments over the dining table were just brilliant. Congrats! Thanks so so much Kathleen, and I always want to dress as colorful as you and then my plans fall apart 😉 Maybe we need to mix! Gasp, ohmygoodness, that is freaking beautiful! I love the chandelier, it’s so, so pretty! Everything is pretty but that chandelier with all the clear ornaments really took my breathe away! Thanks Corinna it’s actually my daughter’s favorite thing too. She says it’s for a princess. Thanks so much for your Tour! Enjoyed each photo! Always pick up a new idea from your posts. Awww thanks so much Patty, I’m always loving your sweet comments. Your chandelier with the greenery around it is just stunning!! Thanks so much, I tried to make it different from last year. I already knew your tour would be amazing, but this is seriously. SO. amazing. Every single detail is perfect right where it is! What a gorgeous home! 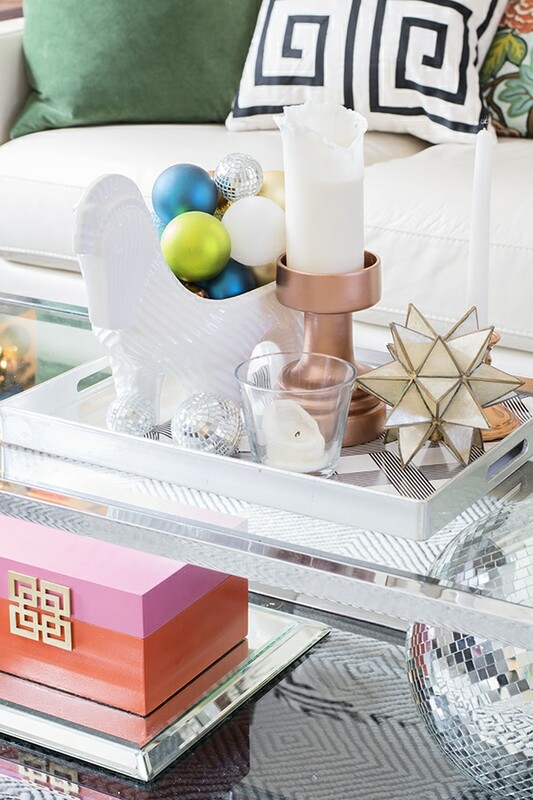 I’m a huge fan of “unconventional” holiday decor with bright colors like pink and blue and you mastered it! I’ve ventured away from the monochromatic Christmas which I have done for years and still love so much as well but I feel like my kids really adore the colored Christmas decor and it’s all about making them happy right now when they are still young, isn’t it? Very pretty. I love all the gorgeous colors. 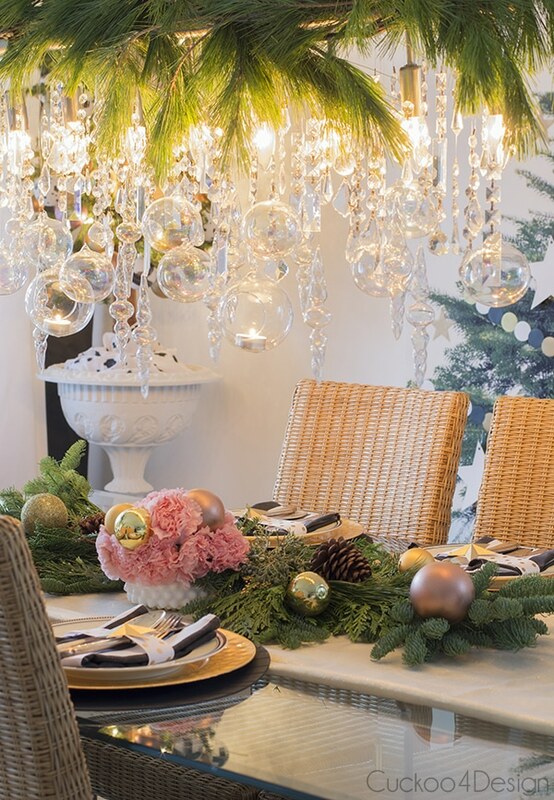 I don’t know what I love more – the stunning chandelier or gorgeous miniature tree! Beautifully decorated! You know that I’d love it if you’d come over for dinner one day. Thanks so much! I’m invited for the holidays right?! Because this gorgeousness is so chic & cozy & I just want to curl up with a cocktail(s) & cookies. Also love seeing the German tradition shout-out! We got some serious G flowing thru our veins over here. Wow…everything looks so beautiful! I love all the different trees everywhere! 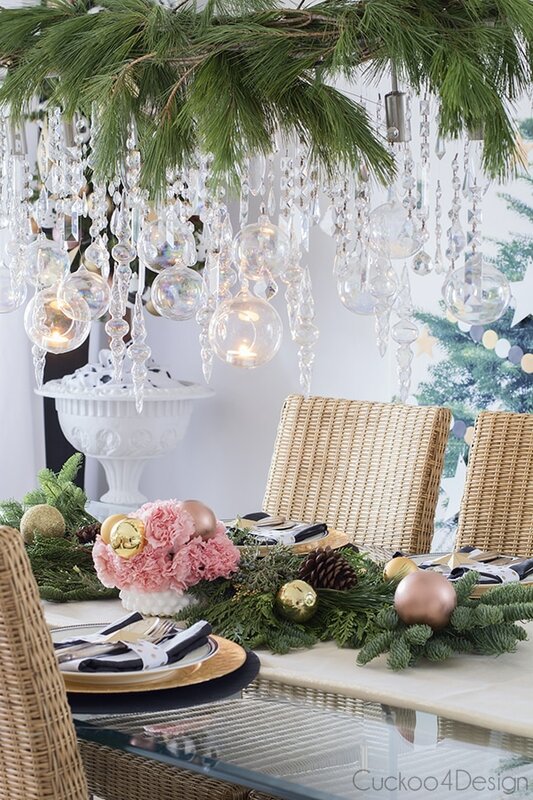 I wanted to try putting the greenery on my dining chandelier but I am worried the needles will fall onto the table…do you find that happening? PS Love that you rescued an outdoor kitty, melts my heart! And thanks so much. I have 3 more kitties which are all rescues. Love them! LOVE LOVE LOVE LOVE it all! It’s so bright and festive and fabulous!! I forgot to tell my husband to get the ikea tree canvas when we was there today, now I really regret it seeing yours! Oh that canvas tree is a must. I don’t know if I can justify bringing it back next year again, but I just love it so much. And thank you! Absolutely stunning Julia!! Beautiful colors, styling, everything. PERFECTION!!! So fun and full of holiday cheer! I love your dining room. So much DIY goodness going on in there. So gorgeous Julia! Love every detail my friend, and your photography is amazing!! Woah! Love it all! This colorful Christmas speaks right to my soul, as I am often heard saying ‘color is my favorite color.’ Hard to pick favorites as everything is fabulous but I am loving those Swiss cross ornaments. And that dining room! Swoon. Thanks and I posted about those swiss cross ornaments today. love all the color and trees!!! Thanks for the visit Sarah! Oh my goodness, this is just out of this world fabulous Julia! I am in LOVE! The colors are just perfect!!! Thank you Caitlin, I really really enjoyed your tour today too. Love all the red. Everything, and I mean every single thing is so beautiful Julia. I think it is perfect. I am also inspired that Monkey is so happy and inside now. Thank you so much my friend. And yes, Monkey is very happy right now and it shows in all the bloody presents she brings me all the time yuck, LOL. Love everything – especially the blinged out chandelier! It’s such a stunner – perfect for Christmas dinners and cocktails – cheers my friend! Thank you so much Kelly, it should read blinged out. I should change the photo description. I love this!! Your home is so beautifully decorated. it should be in a magazine. I love the Ikea tree…and you made all the stars?? !! So impressed. Beautiful Julia! Thanks Albertina, I had to feed my star obsession. Stunning! But I expected nothing less from you! I really like your color selection! Holy gorgeous! The colors, the styling, the photography – all just impeccable. I absolutely love everything you did here. And your chandelier looks like pure Christmas magic. Thanks Jennifer, it’s not as crazy good as yours. No one can top that! Julia – I audibly gasped when I got to your table. It’s stunning. Everything is. I love the trees – and those stars are awesome. I made a few of those last year and they were time consuming. I’d love your tips to make them fast (is it even possible?). Truly a very festive and beautiful decorating job. Love everything but I think I’m particularly in love with your amazing dining room chandelier!! Gorgeous Julia! There are so many elements that I love! 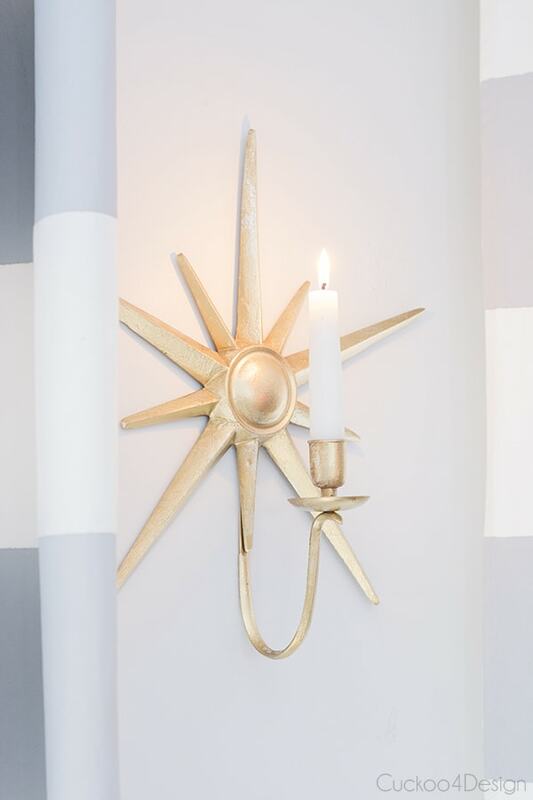 The greenery on your light fixture is genius and so pretty. I also love the colors on the small tree and how they coordinate with your paintings. Everything is stunning! 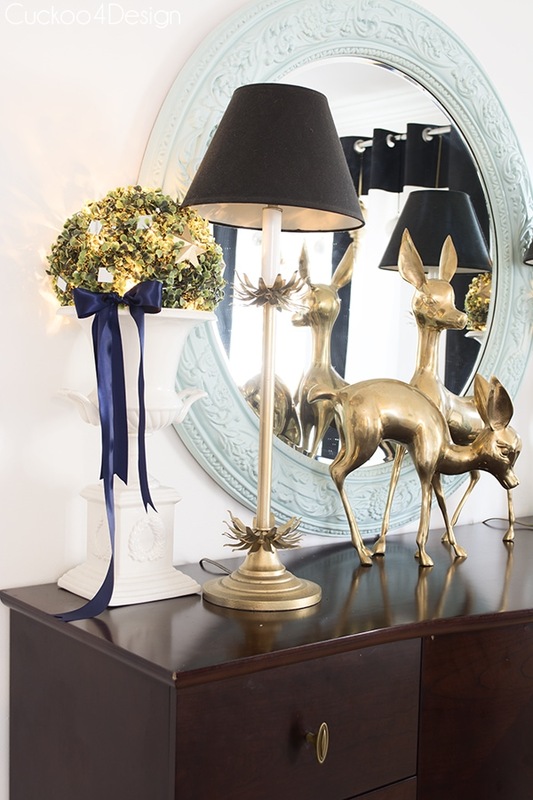 Your colorful and glamorous approach to decorating always wows me Julia! 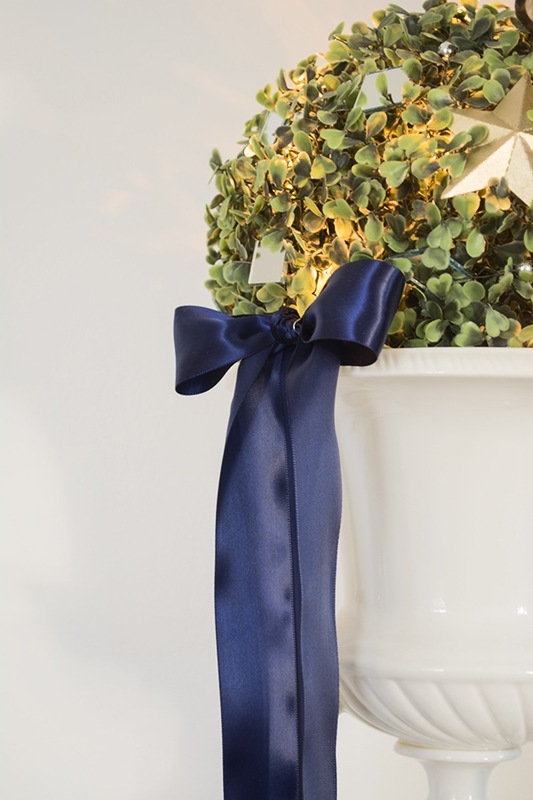 Christmas time is gorgeous in your home! Just beautiful, Julia! Seriously, I love the add-on to the canvas tree. The branches on the chandelier are just stunning. Thanks so much Ashley. Sorry I have been MIA on blog reading lately it’s been a little crazy around here. Julia, your home is absolutely gorgeous! 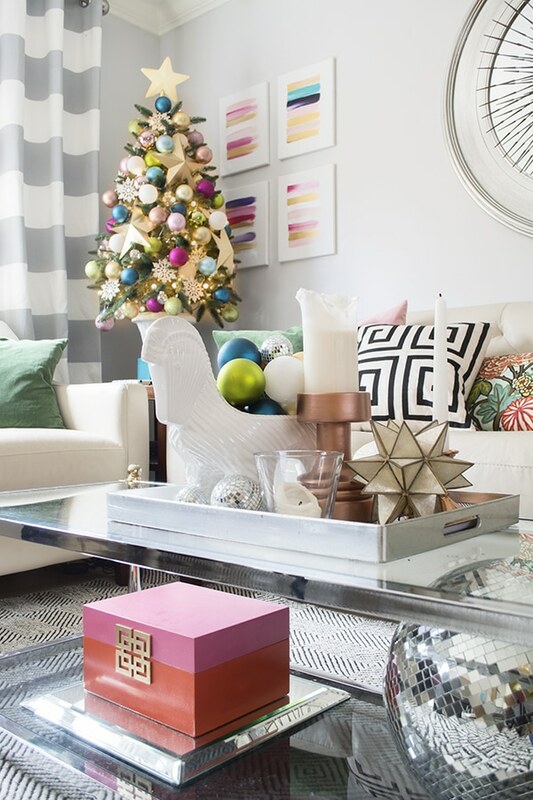 Love love love your Christmas decor and the nontraditional colors. Your home is just dazzling!!!! 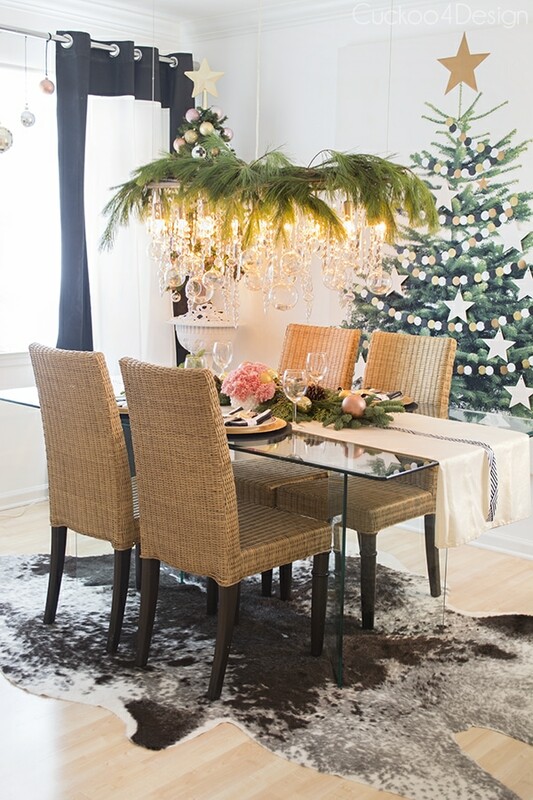 truly inspirational, I wanted to copy that IKEA tree of yours, but my problem is trying to hang it properly where I want it to be and oh my, the chandelier with all the baubles look so glamorous! Thanks so so much Vel. You too and thank you so much Danielle! Julia, I pored over your beautiful tour last week but I’m late to the party to comment! Everything is stunning. I love your handmade stars so much, and your mantle, and everything! I think your dining room chandy totally steals the show, though. Merry Christmas! I love your home! 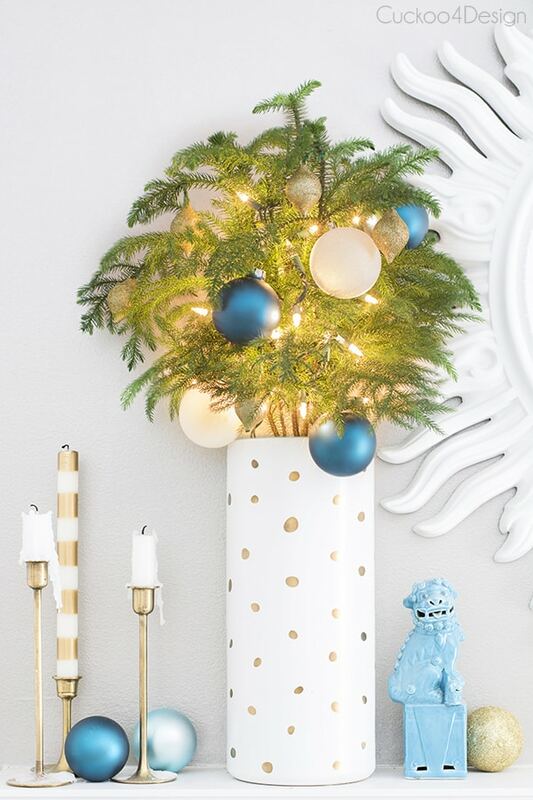 That IKEA Christmas tree fabric is so clever and festive – I’m such a fan of high impact holiday pieces like this! Your home is just beautifully bright and festive. 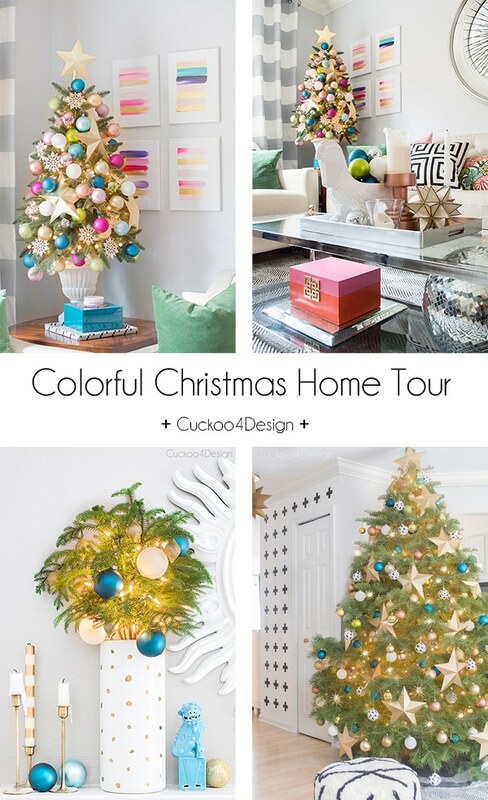 Thanks so much for sharing your home on the 12 Days of Christmas Tour of Homes Link Party! I am sure you have heard it a million time, but that chandelier and your dinning table or amazing. 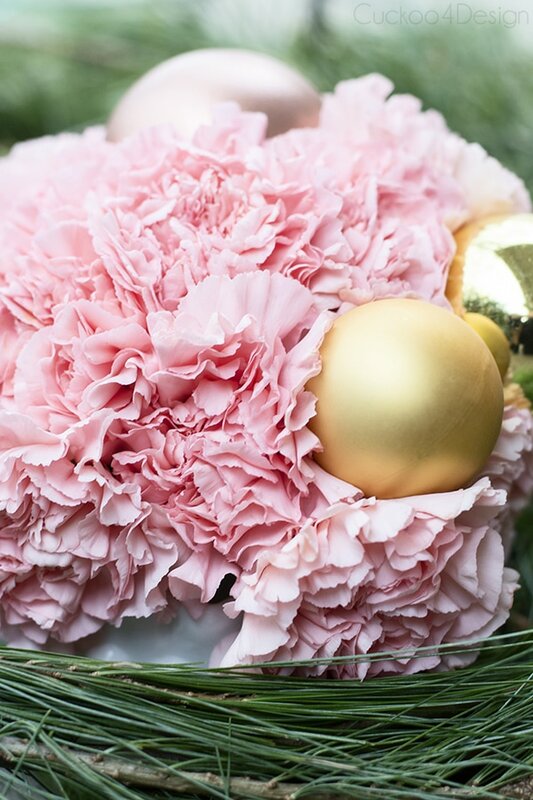 I used bright jewel-toned colors this year as well and I love how merry and bright it feels. Happy Holidays Julia! I just noticed your comment ended up in my spam folder. Have no clue why. So sorry about that. I always so appreciate your comments. Thank you so much for your sweet words and Merry Christmas to you. So pretty! 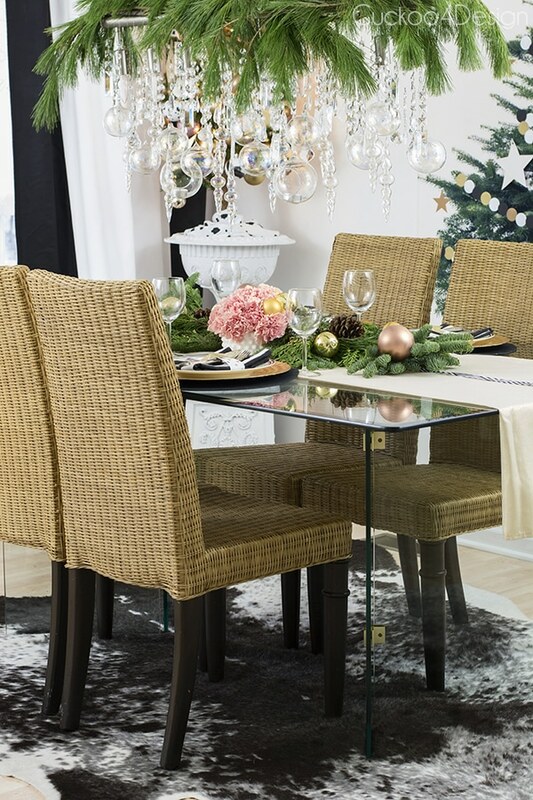 I especially like all the crystals hanging down from your light over the table. Your lovely style reminds me of another blog I read called “Hi Sugarplum”. 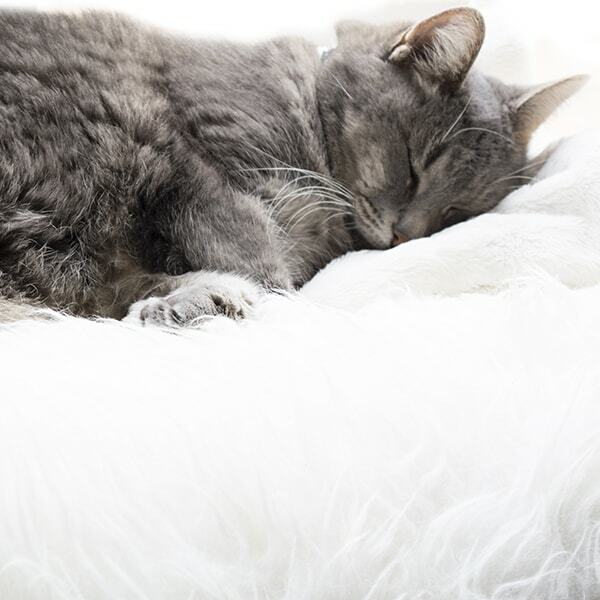 I really enjoyed this post and had never seen your blog before. Thanks so much for all the inspiration! Hi there! Found you thru Pinterest and absolutely love your style! I’m a fellow blogger too. Hope we can keep in touch. Thank you so so much Antonella. It’s so nice to meet you and Merry Christmas. I love your Christmas decor, and I love all your cats, even the blind one. (She is so lovely!). Have a nice Chritmas and better New Year. Thank you Ofelia! And my kitties say hello. I just love everything!!! Where are those adorable brass dear from? I bought them on Craigslist. One of my all time favorite finds. Stunning! I absolutely adore your chandelier! Thanks so much Jodie and have a Happy NEW YEAR! Oh my goodness I’m your new fan! I can’t stop staring at your photos! Oh thank you so much Christine!